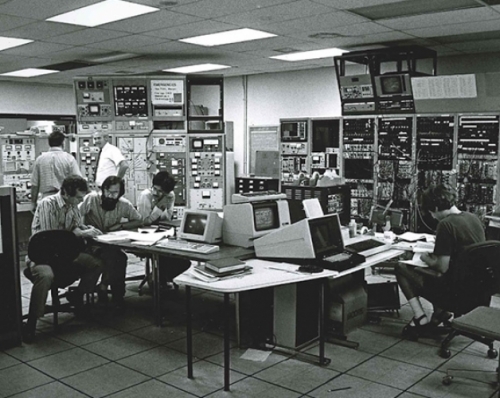 The seated group includes UNC physics professors Tom Clegg and Hugon Karwowski, with their post-doc Chandra Bhat and graduate student Eric Crosson (at far right), during a tandem accelerator experiment in the early 1980s. Standing left at the accelerator controls are TUNL Director Ed Bilpuch (facing the camera) talking with Duke physics professor Russell Roberson. Dust-covered champagne bottles of all shapes and shades of green stand tall on top of a supply cabinet at Triangle Universities Nuclear Laboratory (TUNL) at Duke University. Dates and events written on each one tell the story behind the lab’s 50-year timeline. Leading me beyond this historic champagne bottle array, Tom Clegg, a professor of physics at UNC-Chapel Hill, enthusiastically climbs a set of metal stairs overlooking a particle accelerator. He talks loudly over the din of the humming equipment. A nearby sign reads “Very High Radiation Area: DANGER,” and a nearly 15-foot cement wall surrounds the intricate combination of metal, cords, and magnets below. Clegg bursts with energy. He uses his hands to describe the in-depth role the tandem Van de Graaff accelerator, one of four accelerators at TUNL, plays in nuclear physics research and what makes this lab so exceptional. “No one university has the resources to build a laboratory like this and really staff it,” he says. “We’ve been able, in this laboratory, to have critical mass by having roughly equal-size faculties at Duke and NC State and UNC. TUNL is one of four U.S. Department of Energy Centers of Excellence that focuses on low-energy nuclear physics research. Thanks to the proximity of the three campuses, TUNL houses a distinctive depth and breadth of expertise. Clegg joined the staff at TUNL in 1968 — just three years after the laboratory’s $2.5 million award from the U.S. Atomic Energy Commission helped it purchase the tandem accelerator. In response, UNC, Duke, and NC State combined forces to form a cooperative nuclear physics research program. And share the credit they did — with a pop from a cork. Each champagne bottle marks an important day in the history of the lab. One dated December 29, 1968, celebrated the first beam produced by the lab’s then-new accelerator. Another from May 6, 1991, signifies the day the tandem received a successful upgrade, producing a higher energy beam. Bubbles poured again earlier this month, as TUNL brought alumni together to celebrate its 50-year anniversary. The oldest accelerator at TUNL, the tandem helps researchers study and observe the nuclear structure of an atom, so small that it can only be seen by the most powerful microscopes. The nucleus, however, is 100,000 times smaller still and contains 99.95 percent of the atom’s total mass. “Have you seen pictures of people putting their hands on one of those domes that makes their hair stand up? Well, the tandem is a big version of that,” Clegg says with a grin. The tandem accelerator’s voltage matches that of a lightning bolt and, occasionally, a giant spark will arc between the high-voltage dome and the tank wall, causing the tank to reverberate loudly like a giant bell. Graduate students often use the tandem to study the nuclei of specific elements. Ticehurst focuses on the nuclei of Germanium and Tellurium — both gray-white metalloids, or mixtures of metals and nonmetals. Other scientists can build upon this research to further explore and unwrap the building blocks of life. Other work completed at the tandem, however, has more practical applications. Orlando Coronell, an environmental sciences and engineering professor at UNC, and his graduate student Jingbo Wang, use fast helium beams from the tandem to analyze very thin polymer films. The two hope to improve the overall characteristics of these films for use in commercial systems to remove salt and minerals from water and filter it. Although the tandem was the first accelerator at TUNL, it is not the largest. That designation belongs to the High Intensity Gamma Source (HIGS) — the newest accelerator at the lab and the brightest in the world for producing gamma rays. UNC graduate student Jack Silano uses HIGS to study fission, or when the nucleus of an atom splits into smaller parts. “Despite the fact that we rely on nuclear fission for power,” he says, “there are still aspects of the process that are not fully understood. I’m trying to learn more about the state of a nucleus as it splits apart.” A more in-depth understanding of fission can impact calculations for the next generation of nuclear reactors. Silano says using HIGS is like painting with a very fine brush, versus painting with a broad brush — it allows researchers to physically see the details of these reactions. “The brightness, the polarization, the energy resolution of beams from the accelerator, all allow me to study fission with my own eyes. It wouldn’t be possible for me to see this interaction without this technology,” he says. Other students at HIGS have investigated several different ways of using gamma-ray beams to actively scan cargo containers to detect and identify illicit materials in places with high security. Silano has also partnered with the Japan Atomic Energy Agency, using gamma-ray beams to determine the plutonium content, or the amount of radioactive chemicals, present in storage canisters from the Fukushima meltdown that took place in 2011. Until recently, Cooper’s day-to-day work and research centered on improving ECRIS and upgrading its acceleration tube. Under the guidance of Clegg, Cooper helped design and fabricate a new tube tailored to ECRIS’ high-intensity needs. Now, he can use ECRIS to conduct his doctoral research on a reaction believed to occur within massive stars near the end of their life. Today, TUNL’s scientists also lead extensive collaborative research efforts across the world — from Japan and Germany to the United States — aimed at solving grand challenge physics questions. Some work deep underground in a mine in Lead, South Dakota, where backgrounds are low enough to study the elusive properties of the neutrino — non-charged subatomic particles produced by the decay of radioactive elements — and dark matter. Others prepare for highly difficult neutrino scattering and fundamental symmetry measurements at the Spallation Neutron Source in Oak Ridge, Tennessee. One effort there examines tiny features of the neutron. Researchers know it has no net charge, but does it contain equal amounts of positive and negative charges, which are slightly separated in space? Positive results from these neutron or neutrino experiments could shed light on the mystery of why there is far more visible matter than antimatter in the universe. No matter how groundbreaking or advanced the research at TUNL is, the faculty there believes that one bi-product trumps all discoveries: high-quality graduate students. “Our faculty gives graduate students a chance to grow into themselves and define what contribution in society fits them best — what their skill sets are, what their intellectual interests are, and what their personalities call for. We’ve been doing this since inception of the program,” Calvin Howell, TUNL director and physics professor at Duke, says. In fact, two graduates from the early laboratory became presidential science advisors — George “Jay” Keyworth for Ronald Regan and Jack Gibbons for Bill Clinton. Most recently, UNC graduate Kevin Veal participated in the Iran nuclear talks. “So we have people really involved in nuclear specialties all over the world,” Clegg says. Cheers to the possibilities of more champagne bottles to come. Thomas Clegg is the V. Lee Bounds professor of physics and astronomy at UNC-Chapel Hill. He joined the staff at TUNL in 1968. Calvin Howell is the director of the Triangle Universities Nuclear Laboratory and a professor of physics at Duke University. He completed both his doctoral and postdoctoral research at TUNL and officially joined the staff there in 1985. Christopher Gould is an alumni distinguished undergraduate professor of physics at North Carolina State University. He joined the staff at TUNL in 1969. Orlando Coronell is an assistant professor of environmental sciences and engineering in the Gillings School of Global Public Health. He leads the Coronell Research Group, which studies physio-chemical processes for water purification. David Ticehurst, Jack Silano, and Andrew Cooper are all graduate students in the Department of Physics and Astronomy at UNC-Chapel Hill. Jingbo Wang is a graduate student in the Department of Environmental Sciences and Engineering within the Gillings School of Global Public Health.